A while ago I stumbled upon LightHeart Gear who makes a very innovative shelter. I contacted Judy, the woman behind the cottage, and she agreed to take part in the interview. It is the first woman who run's a UL cottage, so read on to find out how Judy came up with the concept for the tent and where LightHeart Gear is headed! 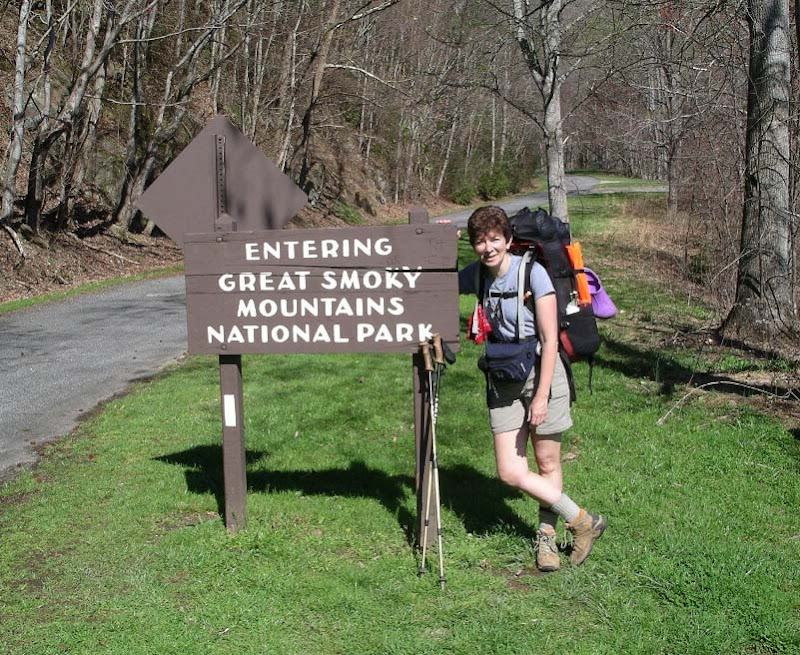 Judy entering the Great Smoky Mountain National park, in 2006 - and still carrying that 4 1/2 lb tent! Judy, please briefly introduce yourself and tell us who you are. Since when are you backpacking, and how did you start? How often are you out backpacking nowadays? Hi, my name is Judy Gross, I grew up in New York City, and did not do any outdoors stuff as a kid. The past 20+ years I have lived in Houston Texas where I raised my twin boys. My sons were in Boy Scouts and I went on a lot of camping and backpack trips with them. In 1999, when they were 14 years old, we drove from Texas to the Great Smoky Mountain National Park. That’s where I first saw the sign for the Appalachian Trail. That’s when the trail started calling my name, telling me to “walk”. In 2006, having never done any thing more than one or two nights out, I set out to Thru Hike the AT. I sustained a shoulder injury in a fall that took me off the trail at about 900 miles. The following year, I went back and did a further 600 miles. I had hoped to go back and start a new Thru hike this year (2010) but my new tent business needs me more. I am planning to hike the John Muir trail this summer though. Two years ago I moved from Houston, Texas to Asheville, North Carolina when my husband retired, so most of my hiking right now is day hikes in the Great Smoky Mountain National Park, where I am working on hiking all the 800 miles of trails in the park. I am not an ultra light backpacker, and never will be, I strive to find the right balance between comfort on the trail and comfort in camp. Some things I’m just not willing to give up (like my tent). When I started the AT in 2006 my pack weight was 37 pounds (with 2 lt of water and 4 days of food). I think if I went back today it would be under 30 pounds. I use a Granite Gear Nimbus Ozone pack, it weighs 3 pounds, but for me it is so comfortable that I don’t notice the weight, I have tried lighter packs, they just don’t carry as well for me. My sleeping bag is a Mountain Hardware 15° or 40° down bag, and my tent is of course is a LightHeart Solo tent. The fun part of the tent is I can take a different colored one each time I go out! Another item I just like for it’s convenience and not for it’s weight is the Jet Boil stove. LightHeart Gear makes a very innovative tent, and currently it's as a Solo version available with a Duo option coming in April. Can you tell us a bit how you conceived the design, where the inspiration came from and how you decided to start the company? Where do I start? I spent 30+ years working as a nurse in emergency rooms, and when I finally retired from that career I decided to pursue my interest and love of sewing and design. I started a small alterations business, and thought I would like to open a sewing school. During my thru hike attempt in 2006, I got really angry about the 4 ½ lb tent I was carrying. So much weight! I went home and bought a (used) single person tarp tent, but I felt very claustrophobic in it. This set me on the road to “Do Better!” My goals for a tent were; Room – I want to be able to sit up, turn around, get dressed in the tent. Simplicity of design, ease of set up, and of course light weight. I wanted my trekking poles to be the tent supports, but I wanted them tucked out of the way where they couldn’t get knocked over. I looked at many of the tents on the market to get some design ideas, and after several attempts and re-design I came up with the version of the tent now on the market. 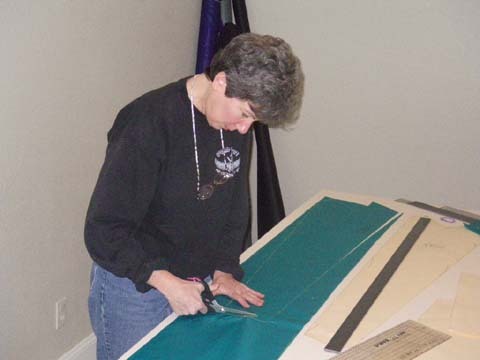 Judy cutting out a new green tent. My husband and I discussed the issues of going into the tent business or opening a sewing school, as you can tell, the tent business won. LightHeart Gear made its debut just 10 months ago at the Franklin North Carolina April Fools Hiker Bash. We sold 3 tents that day, and I had one lady ask if I could make her a purple tent. Customer service being such an important feature, I told her of course, and within 10 days, I met her further up the trail with a purple tent. I think offering tents in a variety of colors gives me a special niche in this niche market. I have made tents in purple, navy blue, green, gray and I even made one in blaze orange. I have had two different women ask for one in pink, but I did talk them out of it. I just can’t see a pink tent sitting out in the woods! I now have new earth tone colors available that will blend into the woods very nicely, and in total I have 24 colors for customers to choose from. 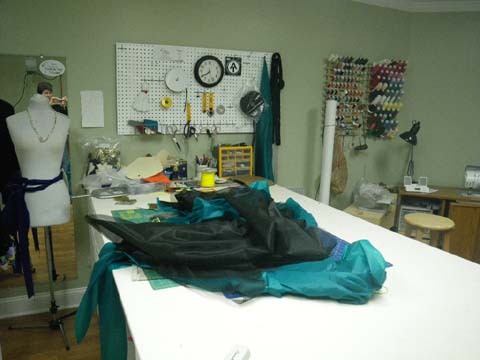 At this time, I make each and every tent myself, I have a wonderful studio in my home where I cut out each tent individually and sew them from start to finish myself. This allows me to keep my inventory low and overhead very low. Starting up in a business like this, not knowing how the tent would be received was scary and I didn’t want to get in over my head. Judy, we love to be let in on the work-in-progress stuff! Can you let us know what kind of new products you're working at the moment? The Duo tent will be available in April. We are having it and the solo now manufactured for us, this will allow me to spend some time on designing a few new items. I will still make the colored versions of the solo tent myself. The many sewing machines, these are the main ones used for the tents. What is the most sold piece of gear from LightHeart Gear, the Solo or the Duo? Also, where do your customer come from? So far, the ONLY piece of gear we have for sale is the Solo, but I have a lot of people asking about the Duo tent. My customers come from all over, I’ve sold 2 tents to people in Japan, and one to Holland. I’ve had inquires from several other countries, and I’ve sold tents all over the USA. People hear about me through the hiking grape vine, different internet hiking communities such as WhiteBlaze, Trail Journals, Trail Place etc. How works the R&D at LightHeart Gear, do you have a need yourself that you try to fix, or do some of your clients inspire you for new products or ask you for solutions to their problems? A little bit of both. The groups I hike with know what I do, and I test ideas and gear out on them. I also ask them for ideas, what would you like to see in a hiking /backpacking item? One thing I learned from this group is that it’s not just backpackers interested in smaller lighter weight gear, it’s cyclists, kayakers, & motor cyclists, they also want small, compact gear that they can fit into small saddle bags etc, most tent poles are way too long to easily take with them, so we have developed alternative, adjustable tent poles that will fold up quite small. 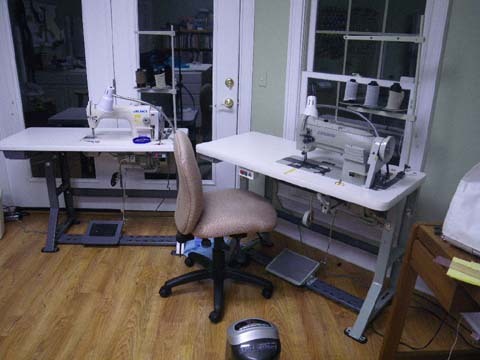 The sewing room with parts of the green tent on the table. I don’t think ultralight backpacking is for everyone, just as long distance backpacking isn’t, but for those that want it, the choices are getting better all the time. I do think it is innovative cottage industries like mine and the others you have interviewed for your blog that are making these inroads. 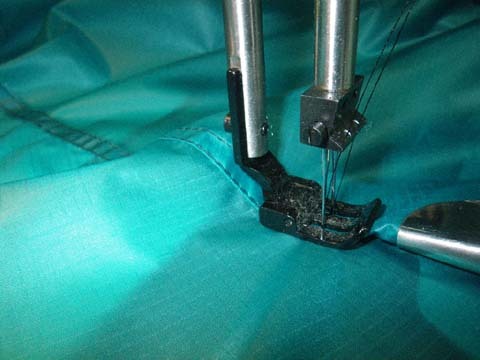 A double needle sewing machine making nice seams. Are you in touch with other cottage manufacturers in Europe, the USA, Canada or other places? LightHeart Gear is very new, but I have met several of the other “cottage industries” at Trail Days or other hiking events, and we have talked about combining our purchase power to get better deals. Judy, I thank you for taking the time to answer my questions. Is there something you would like to add? Hendrik, it’s been my pleasure. If you (or any of your readers) have ideas for gear items they think would be a good idea, I’m always open to suggestions.